The Professional Acting Resume is designed to help actors seeking auditions gain a chance to show a casting director their talent. While there are many talented performers going for the same part, only the actors who manage to get their headshots and resume in by the deadline will be considered. Any actor will tell you the vigilance that must be employed to be successful…as well as the organization necessary for one successful search after another. 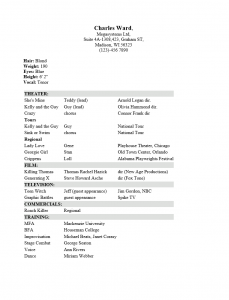 The Professional Acting Resume Template aids in the organization aspect and contributes to the vigilance. Once an ad is placed, an actor has a limited amount of time to react and can do so with a focused high quality document accompanying his or her headshot. The wisest method is to simply fill out an initial template with all your information. Clear out a certain amount of time and make sure the information being documented is well presented and accurate. 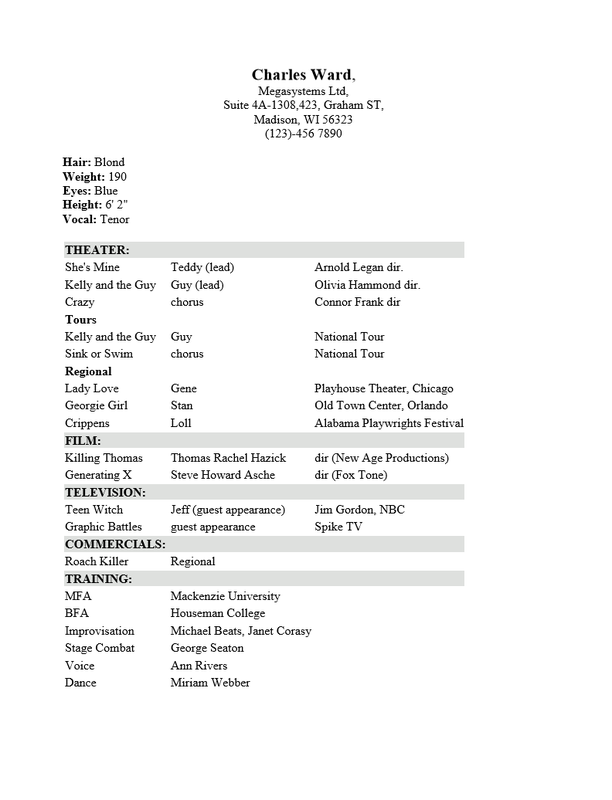 Once this is done, simply copy and paste the applicable information you wish to present from this original to a new Professional Acting Resume Template. This will fully eliminate constant revisions because it will only take a few minutes to create a new one when an opportunity has been spotted. Step 2. You must include a physical description as well. This is the first section after the contact information. At a minimum, it should be your height and weight. This is if you are sending a color head shot. If you are sending a black and white headshot include your hair color and eye color. If you have talent as a singer list your vocal type as well. Step 3. The next section is the Experience section and it must follow a certain formula. The order of the sections within it are: Theatre, Film, Television, Web Series, and Commercials. Only use recent experience and try to pick the roles that are most relatable to the one you are going for. If you do not have experience in one of these sections, do not include it. Each section will have three columns: Name of Production, role/role type, and the director/production company. The columns themselves do not need to have a sub heading. Step 4. The Training section will be where you report where you studied your craft. List the course/degree/certificate and the teacher or school. Step 5. Many professional acting resumes do not require a listing of skills as it is assumed they are going for a specific role that they are suited for. It is assumed they have skills. However, if it is necessary. This would be the last section. It would have the heading “Skills” and each skill would be listed separated with a comma. Leave this section out if it is superfluous.